With the 5.11 Update, IndustrySafe’s OSHA 300A Create Report page has been updated so that you can now generate a CSV file of OSHA 300A data for your applicable establishments. This will allow you to convert your OSHA recordable data into the proper format to comply with OSHA’s New Electronic Recordkeeping Rule. To generate a CSV file in IndustrySafe, first go to Incidents tab. 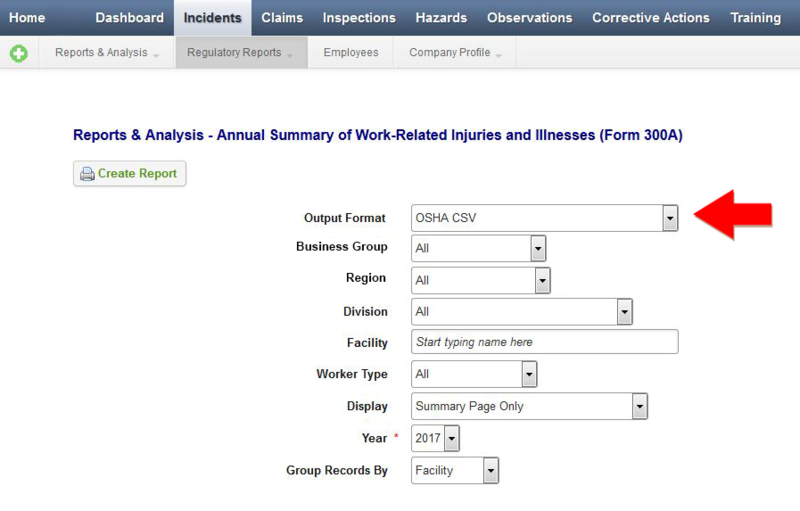 Click on Regulatory Reports, and select OSHA 300a from the drop down menu. On the next screen, select “OSHA CSV” as the report’s output format. You can choose to group your records by Facility, Business Group, Region, or Division. After selecting any desired filters, simply click the “Create Report” button to generate your CSV file. 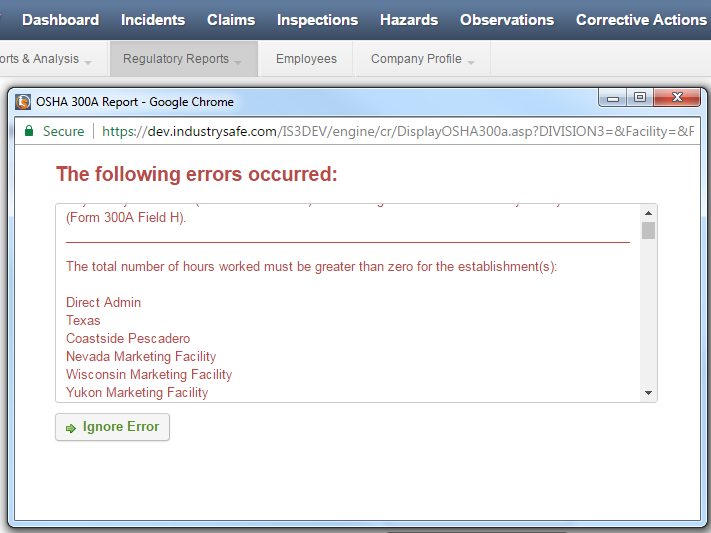 If your organization’s CSV data does not meet OSHA’s validation criteria, an error message will display providing you with additional information about the issue. You can click the “Ignore Error” button if you still wish to generate the report, and the download will start promptly. On August 1, 2017, OSHA's Injury Tracking Application (ITA) was launched to allow safety professionals to electronically submit your 300A data. CSV files downloaded from IndustrySafe are accepted by the ITA. Please be sure that if you open or edit any CSV files from IndustrySafe, you are saving them as a Comma Separated Value file so that the ITA can process the data.